Urticaria is one of the common kind of skin disease also referred to as Hives. Today we were very conscious about our skin. So hives may affect the personality not only physically but also mentally. It appeared like rashes on the skin , will cause severe itching. Urticaria is appears suddenly by the after effects of allergy or some other non-allergic diseases. Red coloured skin with itchy papules. The Hives suddenly appears like a pencil eraser size to dinner plate size, The size of it changes very quickly in short period of time, may take 1-24 hr usually to grow. Sometimes it may combined together to form an appearance called plaques. in most of the cases the hives stays for minimum six weeks. Dr.Rs Roy, One of the Best Dermatologist in India offers excellent ayurveda treatments without any side effects and at an affordable costs!! 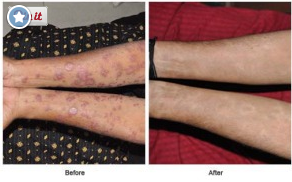 Chronic Urticaria Treatments in India is one of the best option to treat urticaria problems!! Amrita Ayurveda Medical Centre also providing treatments for vitiligo, Psoriasis, Dandruff etc.